Jersey extended their best run of form under head coach Harvey Biljon, running in eight tries at St Peter. Cillian Gallagher's try put Connacht ahead, but Jersey hit back to lead 31-7 at half-time with a hat-trick from winger Tom Howe to add to Brendan Cope's score and a penalty-try. Conor Kenny's try narrowed the gap but Lewis Robling and Gary Graham crashed over at the other end. James Freeman completed the rout, which puts Jersey second in Pool Five. Jersey have lost just one of their last seven matches, a last-minute defeat to Newport Gwent Dragons. The islanders have now won four in-a-row for the first time since promotion to the Championship in 2012. A week on from Jersey's 40-10 win over Connacht in Galway, the Irish side went ahead after eight minutes when Gallagher breached a gap in the defensive line to touch down. The Channel Islanders were level though when referee Jack Makepeace awarded a penalty-try as a maul crashed to ground near the line, with Tongan Uili Kolo'ofa'i poised to score. Howe, on loan from Wasps, got his first try after a good break from Oli Evans and then soon after Howe benefited from a great offload by skipper Alex Rae to score again. Fly-half Cope secured the bonus-point as he zigzagged through missed tackles for Jersey's fourth before Howe completed his hat-trick inside 37 minutes. Connacht started the second-half brightly and centre Cormac Brennan evaded three tackles before academy prop Kenny crashed over to make it 31-12 four minutes after the break. There was to be no stirring comeback from the Eagles though, with Robling darting in for the hosts' sixth try before Graham was driven over at the maul and then flanker Freeman got the eighth with time ticking away. 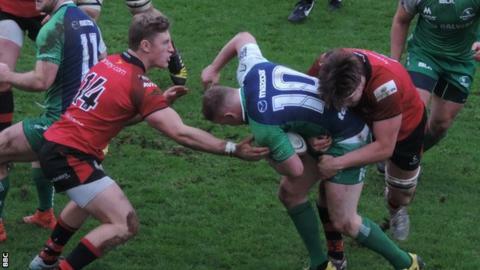 The result leaves Connacht bottom of British and Irish Cup Pool Five with no points from their four matches, while Jersey move above Newport Gwent Dragons and are now three points behind leaders Doncaster Knights.